Editor’s note: This article was updated on October 10, 2016 to correct the year the Military Accessions Vital to the National Interest (MAVNI) program was launched. Naturalization, an important milestone in immigrant integration, extends to foreign nationals the same benefits, rights, and responsibilities that native-born citizens have, including the right to vote. More than 653,000 immigrants naturalized in the United States in fiscal year (FY) 2014, bringing the total number of naturalized U.S. citizens to 20 million, nearly half the overall immigrant population of 42.4 million. Over the past decade, the annual number of naturalizations has ranged from about 537,000 to just more than 1 million, depending on factors including processing times and backlogs as well as the financial constraints and personal motivations of immigrants themselves. Becoming a naturalized citizen is contingent upon meeting certain requirements, such as completing a period of lawful permanent residence, demonstrating basic proficiency in English and knowledge of U.S. history and government, and passing the background check. The benefits of naturalization include the right to sponsor immediate family for immigration, greater access to government benefits, and protection from deportation. In addition, immigrants who naturalize often experience substantial economic dividends, such as higher incomes and homeownership. This article examines the latest U.S. naturalization data available, including historical trends and socioeconomic characteristics of naturalized citizens. Unless otherwise noted, data on the number and characteristics of foreign nationals who naturalized during FY 2014 are from the Department of Homeland Security (DHS) Office of Immigration Statistics (OIS). Note: All yearly data on new naturalized citizens are for the federal fiscal year, which runs from October 1 through September 30 of the given year. The term "foreign born" refers to people residing in the United States at the time of the census who were not U.S. citizens at birth. The foreign-born population includes naturalized citizens, lawful permanent residents (LPRs), refugees and asylees, legal nonimmigrants (including those on student, work, or certain other temporary visas), and persons residing in the country without authorization. In FY 2014, the most recent year for which data were available at publication, U.S. Citizenship and Immigration Services (USCIS) received 773,824 applications for citizenship and naturalized 653,416 individuals. The number of individuals who naturalized in FY 2014 decreased by 16 percent from FY 2013 (779,929). Although the number of naturalization applications remained relatively stable, the number of pending cases increased substantially: from 307,965 at the end of FY 2013 to 379,790 at the end of FY 2014. Naturalization—the process by which foreign citizens or nationals take the citizenship of their country of residence—is a multistep process that concludes with a naturalization ceremony during which an immigrant takes an oath of allegiance to the United States. To be eligible for naturalization, an immigrant must be at least 18 years old; have lawful permanent residence (LPR status, also known as a green card) for at least five continuous years (three continuous years if the individual is married to a U.S. citizen); have no criminal record; possess the ability to read, write, and speak simple words and phrases in English; and demonstrate knowledge and understanding of U.S. history and government. USCIS denied 66,767 naturalization petitions in FY 2014. Applicants can be denied citizenship if they cannot prove the required length of permanent residence in the United States, are found to lack allegiance to the United States, are determined to have bad moral character, and/or fail the required English language or American civics test. Laws passed by Congress in 1986 and 1996 partly contributed to the upward trend in naturalizations in the second half of the 1990s (see Figure 1). Under the 1986 Immigration Reform and Control Act (IRCA), 2.7 million unauthorized immigrants received lawful permanent resident (LPR) status, which increased the pool of those eventually eligible for naturalization. Three federal laws passed in 1996—the Personal Responsibility and Work Opportunity Reconciliation Act (PRWORA), the Illegal Immigration Reform and Immigrant Responsibility Act (IIRIRA), and the Anti-Terrorism and Effective Death Penalty Act (AEDPA)—limited access to public benefits and legal protections for noncitizens, thereby encouraging more immigrants to apply for naturalization. The 59 percent increase in naturalizations (from 660,477 to 1,046,539) between FY 2007 and FY 2008 is the result of naturalization campaigns launched ahead of the 2008 presidential elections and an impending increase in naturalization application fees (which took effect on July 30, 2007). Together, these actions created a backlog in naturalization applications, prompting USCIS to take steps to reduce processing times in late 2007. The number of pending cases subsequently fell significantly from 1.1 million at the end of FY 2007 to 480,000 in FY 2008 and 230,000 in FY 2009 (see USCIS: Backlog in Naturalization Applications Will Take Nearly Three Years to Clear and the MPI brief, Immigration Fee Increases in Context). Source: Department of Homeland Security (DHS), Yearbook of Immigration Statistics (Washington, DC: DHS Office of Immigration Statistics, various years), available online. In recent months, naturalization applications grew significantly. The 440,000 applications received in the first two quarters of FY 2016 (October 2015 to March 2016) represented a 21 percent increase compared to the same period in FY 2015 (363,000). This increase can partly be attributed to the citizenship awareness campaign launched by the White House Task Force on New Americans, as well as a desire to vote in the 2016 national elections. Click here for an interactive data tool showing the annual number of naturalizations in the United States, from FY 1910-2014. Of the 13.3 million LPRs in the United States as of January 1, 2012, nearly 8.8 million were eligible to naturalize, according to the latest available OIS estimates. Mexico was the leading country of origin among LPRs eligible to naturalize in 2012, accounting for an estimated 2.7 million or 31 percent. Other top origin countries include the Philippines, with 340,000 (4 percent); the Dominican Republic, with 310,000 (4 percent); Cuba, with 300,000 (3 percent); and China, with 280,000 (3 percent). Top states of residence for those eligible to naturalize in 2012 included California, with 2.5 million (28 percent); New York, with 1.1 million (12 percent); Texas, with 930,000 (11 percent); Florida, with 830,000 (9 percent); and New Jersey, with 370,000 (4 percent). Of the 653,416 immigrants who naturalized in FY 2014, 15 percent were from Mexico (95,889), followed by 6 percent from India (37,854), 5 percent each from the Philippines (34,591) and China (30,284), and 4 percent each from Cuba (24,092) and the Dominican Republic (23,775). Nationals of these six countries accounted for close to 38 percent of all naturalizations. Other leading countries of origin included Vietnam (18,837 or 3 percent), Colombia (16,478, 3 percent), El Salvador (15,598, 2 percent), and Haiti (13,676, 2 percent) (see Figure 2). Examining naturalizations over time, Mexico remained the top country of birth for new naturalized citizens in both FY 2000 and FY 2014, but accounted for a lower share of the total annual naturalizations in FY 2014 than in FY 2000. India and the Philippines overtook Vietnam and China for second and third places. While Iran, Jamaica, and Korea were among the top ten origin countries in FY 2000, they were replaced by Haiti, Colombia, and Cuba in FY 2014. Source: DHS, Yearbook of Immigration Statistics, 2002 and 2016, available online. In FY 2014, more than half of new naturalized citizens lived in four states: California, Florida, New York, and Texas. Approximately 21 percent of new citizens resided in California (140,234), 12 percent apiece in Florida and New York (79,637 and 77,717 respectively), and 8 percent in Texas (52,879). With 217 new naturalized individuals, Wyoming had the fewest naturalizations of all states in FY 2014, followed by Montana (304) and West Virginia (415). One-third of new citizens who naturalized in FY 2014 resided in three metropolitan areas: greater New York City (100,250 or 15 percent), Los Angeles (57,674, 9 percent), or Miami (52,544, 8 percent). These metropolitan areas, together with the greater Washington, DC area (24,648, 4 percent), Chicago (24,617, 4 percent), San Francisco (19,842, 3 percent), Houston (17,547, 3 percent), Boston (17,311, 3 percent), and Dallas (16,581, 3 percent) were home to slightly more than half (51 percent) of all new U.S. citizens in FY 2014. In 2014, the median number of years of residence between the date when LPR status was conferred and the date of naturalization was seven years, the same as in the previous two years. Note: The median time period for naturalization among LPRs born in North America reflects lower than average naturalizations among the Mexican born. For more information, see Mexican Immigrants in the United States. Source: DHS, Annual Flow Report – U.S. Naturalizations: 2014 (Washington, DC: DHS Office of Immigration Statistics, 2016), available online. Naturalization rates vary by nationality, as does the amount of time individuals spend as LPRs before naturalizing. Factors affecting the median number of years of residence between the date of legal immigration and of naturalization include delays by the applicants in filing for naturalization (including ability to pay the required fees) and in attaining English language proficiency; perceptions and attitudes about citizenship (including assessment of the risk of losing rights and/or property in the origin country); and institutional factors such as processing time, security check delays, and backlogs. During times of peace, noncitizen members of the armed forces may obtain citizenship after a one-year waiting period. Launched in 2009, the Military Accessions Vital to the National Interest (MAVNI) program allows certain noncitizens with in-demand skills, particularly in health care and critical languages, to join the Army in exchange for expedited U.S. citizenship. Section 329 of the Immigration and Nationality Act authorizes the president to issue executive orders specifying periods of conflict during which foreign-born members of the U.S. military are eligible for immediate U.S. citizenship. In July 2002, President George W. Bush issued such an executive order, designating September 11, 2001 as the start day of a period of hostilities. As a result, foreign-born, noncitizen military personnel serving on or after that date became eligible for expedited citizenship. As of FY 2015, approximately 109,000 foreign-born members of the U.S. armed services have become citizens since the September 11, 2001 attacks, including 11,069 who naturalized while serving overseas or aboard U.S. Navy ships. Between FY 2008 and FY 2015, close to 90 percent of the 6,790 overseas military naturalizations took place in five countries: Iraq (1,839 individuals), Japan (1,553), Afghanistan (1,017), South Korea (904), and Germany (764). The following data show the socioeconomic characteristics of all naturalized immigrants in the United States as of calendar year 2014 and are from the U.S. Census Bureau 2014 American Community Survey (ACS). In 2014, 20 million foreign-born individuals were naturalized U.S. citizens, representing 47 percent of the nation’s 42.4 million immigrants, according to 2014 ACS estimates. Compared to immigrants who have not become citizens, naturalized citizens are better educated. In 2014, 34 percent of naturalized citizens ages 25 and older possessed a bachelor’s degree compared to 23 percent of noncitizens and 30 percent of the native born. Twenty percent of naturalized immigrants had not completed high school, versus 40 percent among noncitizens and 10 percent among the U.S. born. Naturalized citizens also have higher median earnings than noncitizens and higher median household incomes than the native born. In 2014, median earnings for naturalized males and females working full-time, year-round ($50,343 and $40,585 respectively) were higher than median earnings for noncitizen men and women ($30,862 and $25,231 respectively) and roughly on par with U.S.-born individuals ($50,734 for males and $40,052 for females). Median household income for naturalized citizens ($59,072) was higher than both noncitizen households ($40,085) and U.S.-born households ($54,565). On average, households headed by noncitizens tended to include more workers (1.58 workers) than households headed by naturalized citizens (1.47) and U.S.-born individuals (1.18). Furthermore, naturalized citizen have the same homeownership rates as the U.S. born. In 2014, 65 percent of naturalized immigrants lived in owned housing units, equivalent to the U.S. born, while one-third of noncitizens lived in owned houses. Click here for an MPI report examining the economic effects of citizenship for immigrants in the United States. Department of Homeland Security (DHS), Office of Immigration Statistics. Various years. Yearbook of Immigration Statistics. Washington, DC: DHS Office of Immigration Statistics. Available Online. ---. 2016. 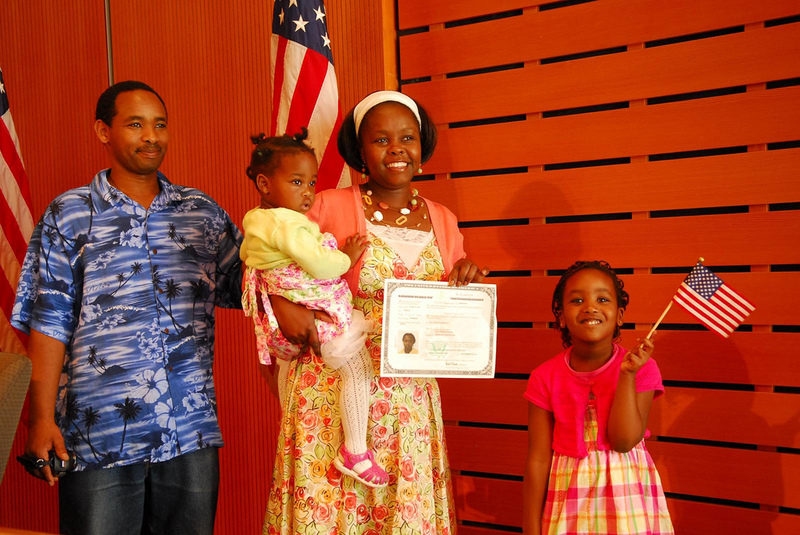 Annual Flow Report – U.S. Naturalizations: 2014. Washington, DC: DHS Office of Immigration Statistics. Available Online. U.S. Census Bureau. 2015. 2014 American Community Survey. American FactFinder. Available Online. U.S. Citizenship and Immigration Services (USCIS). 2013. Estimates of the Legal Permanent Resident Population in 2012. Available Online. ---. 2015. Naturalization through Military Service: Fact Sheet.Available Online. ---. 2016. USCIS Regular and Military Naturalization Form N-400 Performance Data; Fiscal Year 2010 - Fiscal Year 2016 (2nd Quarter). Available Online. U.S. Department of Defense. N.d. Fact Sheet: Military Accessions Vital to National Interest (MAVNI) Recruitment Pilot Program. Washington, DC: Department of Defense. Accessed August 9, 2016. Available Online.